Sandringham was one of eight land settlements created by the Commission of Government in Newfoundland to lessen dependency on the fishery and to promote agriculture (the others were Markland, Haricot, Lourdes, Midland, Brown's Arm, Winterland and Point au Mal). Founded in 1939, Sandringham was categorized as a "small-holding" settlement, and was designed to provide families with farmland to supplement their income from other sources such as fishing, logging or wage-work. The site selected was a small but well-wooded, low lying coastal plain (the bottom of a former lake) bordering on the land-locked Northeast Arm of Alexander Bay. This area was formerly known simply as "The Arm", a good place for woodcutting and berry picking. It was originally surveyed to provide five acre lots for fifty families. This was changed to twenty-five families with ten acre holdings (half of those originally surveyed were found to be too rocky or unsuitable for cultivation). A Land Settlement Cottage from 1940. Photo by Gordon Handcock, ©2000. Reproduced by permission of Gordon Handcock. At the outset, families were selected from applicants who had at least one able-bodied male who could participate in the arduous labour of land clearing and building a community. Sandringham was developed under a three-year plan during which time families were supported and their holdings capitalized according their need and effort. Bonuses, in the form of seed, farming equipment and livestock, were awarded for land clearing, barn building and other activities. Among the land settlements, Sandringham was one of the few to be completed on time and within budget. In the long term Sandringham proved out to be one of the more successful of the land settlements, a tribute to its settlers since they had among the poorest soils and most difficult land to develop of all the land settlements. The barn had been destroyed by 2002. Photo by Gordon Handcock, ©1969. Reproduced by permission of Gordon Handcock. Most of the families (18 out of 25, or 72 percent) originally selected for Sandringham had formerly been involved with the Labrador fishery. This fishery declined rapidly during the 1930s and left many hard pressed. The remaining settlers formerly worked as carpenters or general labourers. One had actually been a farmer at Eastport. While a few of the first settlers left after a short time, these were replaced and Sandringham was formed from families drawn from ten separate communities. These included Salvage (Handcock, Hapgood, Oldford and Squire), Flat Islands (Chaytor, Heffern and Samson), Badger's Quay (Brown and Hunt), Eastport (Bradley, Bull and Lane), Glovertown (Williams), Bunyans Cove (Harvey and Hobbs incl. Penney), Winterbrook (Elliott). The land settlement was bordered on the east by a sandy embankment (part of the peninsular glacial sand delta) and was appropriately named Sandringham for that natural feature as well as its commemoration of a British royal estate. It was otherwise sheltered by hilly ridges to the south and west and by well-wooded surroundings. 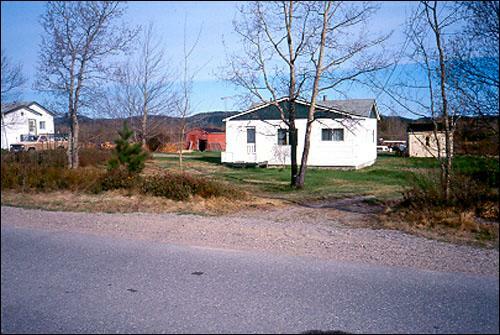 Until the 1960s Sandringham was one of smaller communities on the Eastport Peninsula. In 1996 a population of 291 was recorded which ranked it second only after Eastport (pop. 557). In recent decades Sandringham has been the only community on the peninsula to experience any significant population growth, though it declined slightly by 17 persons between 1991 and 1996. To some degree, Sandringham has grown at the expense of Burnside and St. Chad's. Modern suburban styled homes in Sandringham. In 1955, twelve of the original twenty-five settlers at Sandringham still classed themselves as farmers. This was the highest succession rate in any of the original eight land settlements. According to a Newfoundland agricultural census in 1944, among the land settlements Sandringham had the largest total production of potatoes and turnips and the second largest yield of cabbage (after Winterland). In 1944, Sandringham also ranked third among all Newfoundland settlements (after Cartyville and Searston on the west coast) in per capita production of potatoes and placed third (after Pasadena and Winterland) in turnip yields. Sandringham also ranked eighth in cabbage production. These data show that in just four years Sandringham had become well established as one of the island's leading farm communities, a role it did not relinquish until recently. This was a remarkable achievement since it had been originally intended that Sandringham settlers would be only part-time farmers. 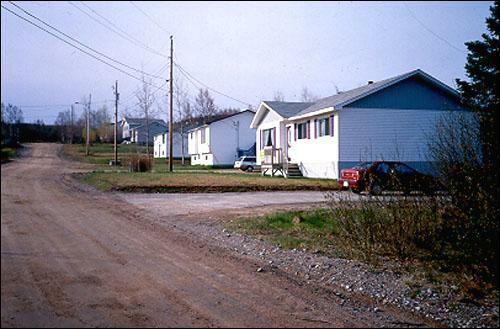 By 1944, Sandringham was well established as one of Newfoundland's leading farm communities. Photo by Gordon Handcock, ©1982. Reproduced by permission of Gordon Handcock. In the recent past Sandringham has enjoyed the advantage of being the closest settlement on the peninsula to the Trans Canada Highway and within easy commuting range of Glovertown, Clarenville, Gander and Terra Nova National Park. 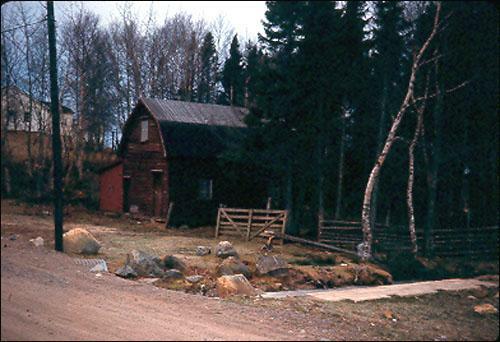 Abandoned farmland has provided opportunity for easy and convenient residential construction. While Sandringham has become largely a community of commuters, holiday cottagers and retired persons, several descendants of original settlers are still involved in producing root crops, strawberries and tomatoes which are marketed to tourists and to local residents. Although compact in size and orderly arranged, features of its land settlement origins, Sandringham as a settlement is not easily comprehended since, except from the air or from distant hills (or on a map or aerial photograph), much of the built environment lies hidden from view by birches, aspen, spruce, fir and alders. 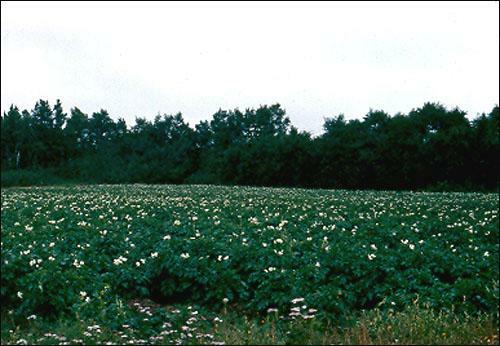 A substantial portion of the land once used for farming has regenerated and trees left along property lines and in marginal areas have thickened to the extent that the landscape appears to be still in a natural state. Within this sylvan setting, however, and interspersed among houses of more recent suburban design, it is still possible to observe some of the original land settlement hipped-roofed cottages and a few of the gambrel-roofed barns introduced in the early 1940s. These heritage structures speak to the special origins and history of this community.